I first visited this private island two years ago, while charting out The Best Kept Secrets of Kerala trail for India Untravelled. When we impulsively decided to fly from Singapore to Kochi a few days back, I found myself craving the tranquillity of this little paradise. It is neither a resort nor a homestay, but just a place that perfectly encapsulates the languid way of life in these backwaters. 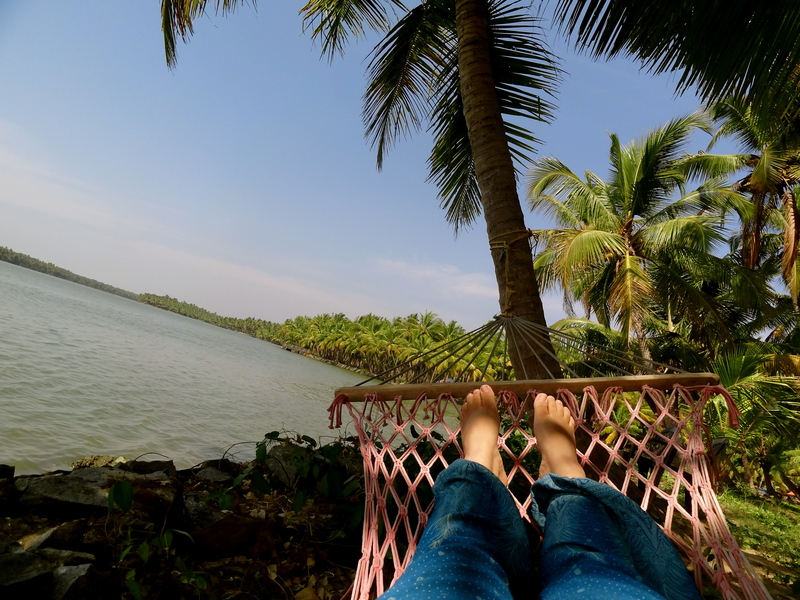 My little paradise by the backwaters of North Kerala. On sunny afternoons, we swing on hammocks under the shade of coconut trees, watching public ferries collect people from islands that have no road access. On open boats, we sail along a labyrinth of islands with sleepy coastal hamlets, watching fishermen catch fish on their hardy wooden kayaks. Parts of these backwaters are cordoned off for mussel farming, which was pioneered by our host, Mr Gul Mohammed, decades ago, inspired by a newspaper article! Mussel cultures are cultivated in these expansive backwaters, and the mussel extracted through wooden stick-like structures for export, creating livelihoods for 6000 coastal farmers. We swim in the backwaters (they are that clean! ), and in the roaring waves of the Arabian Sea on some virgin beaches that lie undiscovered on these islands. Walking amid colourful houses hidden by coconut trees, we converse with shy, well-dressed kids, impressed by the standard of living and cleanliness in this remote part of Kerala. When a kid asks me where I’ve come from, I think to myself, from another world. Golden hues of sunset on a virgin beach in North Kerala. Have you experienced the backwaters of North Kerala? Join The Shooting Star on Facebook, Twitter and Instagram for offbeat travel stories from around the world. I have experienced the backwaters of Kerala (don’t know North or South) in Cochin. It was an awesome experience. I just felt lost and draped in beauty. Sounds like you had an exceptionally good and peaceful time there. Cochin would be south. The backwaters in the north are very different, for the absence of houseboats and tourism. For your next trip! Lovely! In my Travel Bucket list actually… do you think the serenity of the backwaters will crumble if two screeching kids tagged along? Hello Shivya, So nice to see this post, as this is one place where I used to take my friends, relatives and colleagues whenever they come down to my home. Nice to see that you had a great time there. Oh wow, small world! Do you live in North Kerala? I’ll get you the info ASAP, I heard, recently a very nice home stay has started right there in the island. I am itching to go to Kerala soon. You describe it so beautifully. these backwaters view was quite amazing. i would like to visit boat house and have curry fish during my travel to Kerala. The hill stations in Kerala are my favourite. There’s so much of beauty that you wouldn’t want to return home. Kerala is really a best place in India to visit as here is the most amazing and beautiful Backwaters and Beaches located. You can also do some outdoor sports activity here. You will be mesmerized to see the natural beauty of the temples and backwaters. Golden Triangle Tour with Kerala is the best tour package to visit and explore. Next PostToronto: 7 Best Free Things to do.